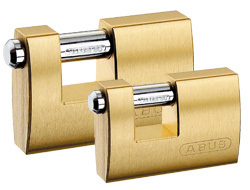 Also known as block, straight shackle and warehouse padlocks, they are designed specifically for roller shutters but often used on warehouses and containers due to their high security design. 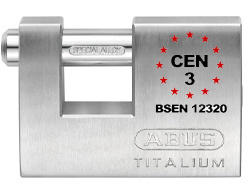 The straight shackle goes through the two rings and connects to the block padlock ensuring maximum strength and minimum amount of shackle exposure making it exceptionally difficult to get cutting tools to it. Many of the blocks themselves are made of hardened materials making it very hard to smash them off also.